After a marathon excavation effort, the body of Matthew Flinders has been discovered beneath Euston station in London. Let’s take a look at the life and achievements of the man who circumnavigated Australia. Flinders was born in England on March 16, 1774. He joined the navy at 15 and served under William Bligh on a trip to Tahiti in 1791. He fought against the French in the naval battle of the Glorious First of June 1794, according to the Australian Museum. Flinders sailed to Australia in 1795 to begin his survey work. Shortly after his most famous voyage, Flinders was captured by the French on his return to England and held prisoner for more than six years. Just four years later he died of kidney failure at the age of 40 — the day after the book detailing his circumnavigation of Australia was published. The Australian Museum says Flinders was “an outstanding sailor, surveyor, navigator and scientist”. After it became known French explorer Nicholas Baudin was planning to circumnavigate Australia, Flinders was sent out with his good friend George Bass to do it quicker than his French counterpart. Historian Dave Hunt described the circumnavigation as a race. “[Joseph] Banks says to Flinders, ‘I need somebody to go out and sail around the continent quicker than him’, so Flinders and [his cat] Trim are actually racing Baudin and his pet monkey around Australia [between] 1801 and 1803,” Mr Hunt explained to the ABC in the Rum Rebels and Ratbags podcast. In 1801 Flinders began his circumnavigation of the continent, and was later accompanied by an Aboriginal translator, Bungaree, who he had worked alongside in 1789. By 1803, Flinders had won, becoming the first person to circumnavigate Australia and identify it as a continent. Mr Hunt says Flinders was also the first to seriously propose and popularise the name “Australia” for the continent he sailed around. Before his most famous voyage, Flinders also circumnavigated Tasmania, proving it was separate from mainland Australia. What’s the deal with his cat again? Flinders’s cat Trim was born in 1799 on board the HMS Reliance while Flinders sailed from the Cape of Good Hope to Botany Bay. 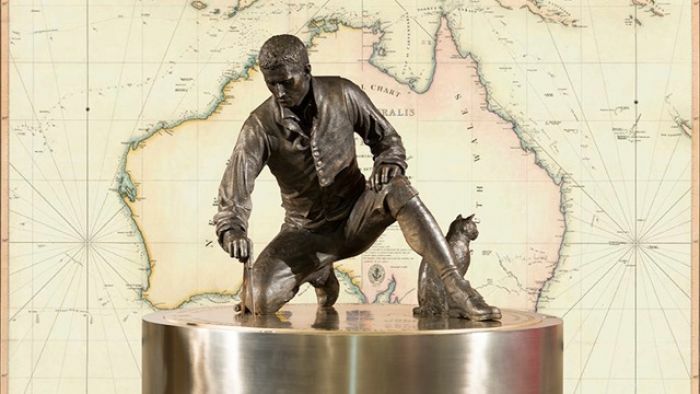 The legend goes that Flinders became enamoured with his feline friend when Trim fell overboard as a kitten and managed to swim back to the boat and climb a rope to safety. Flinders choose the name Trim after the butler in Laurence Sterne’s book Tristram Shandy. Trim was so central to Flinders’s life that he appears alongside him in many of the statues of Flinders around Australia. What’s the story been with the hunt for his body? Flinders was buried in a cemetery that later became London’s Euston railway station. Euston is one of London’s main stations and it is in the middle of a major upgrade to accommodate the UK’s $101 billion HS2 high-speed rail project. That means Flinders’s remains, and those of 45,000 others, have to be moved. It’s Britain’s biggest-ever excavation project. But until now, the archaeologists (more than 1,000 of them) that are working around the clock to exhume the skeletons didn’t know exactly where Flinders was. “We have a list of all the famous people who were buried here, Matthew Flinders is obviously one of the most exciting ones, but unfortunately we don’t have an exact plan of the burial ground,” Helen Wass, the project’s head of heritage, told the ABC last year. Some of those famous people include famous American boxer Bill Richmond, known as the world’s first black sports star, and members of the Christie family who founded the famous auction house. Work won’t stop now that Flinders have been found though. It’s expected the excavation work will continue for at least another year. What happens to his body now? Flinders’s remains will undergo testing for more clues about his life. Then he’ll be interred with the other bodies that have been exhumed at an undecided site in the future.